The new Moroccan 5-star resort La Bahia Blanca is a relaxing luxury getaway that brings Moroccan style to the banks of the Mediterranean. 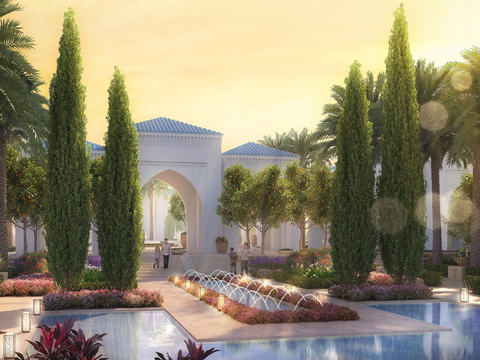 Cracknell’s design for the outdoor areas emphasised the resort’s setting by integrating Moroccan architectural and design elements throughout, despite the style being known for rich interiors and enclosed rooms. Marrying the feel of a wide, open space with an architectural style known for closed spaces, the landscape creates a series of outdoor ‘rooms’ that reference traditional courtyards, before opening out onto the sea. A tone-on-tone light colour palette emphasised the resort’s open, airy, seaside atmosphere. 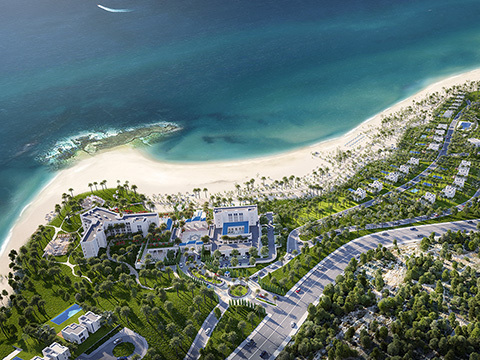 Though all beaches in Morocco are designated as public, by raising the beach approach hotel guests enjoy a seamless transition to the beach, while maintaining privacy. 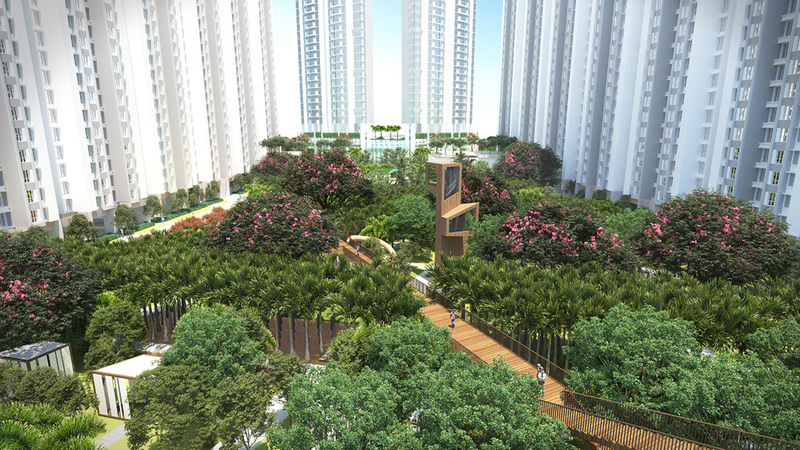 The design of two plots gives a distinctive take on an urban forest. 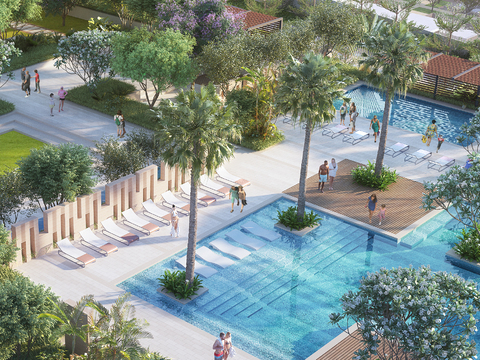 A mid-range community with retail and F&B outlets provides active living integrated with the forest landscape, whilst a luxury residential development is found within a paradise of lush flowering and scented plants. A pioneering program retains or replenishes over 2,000 trees on the site, cultivating a breath-taking immersive forest with a floating sky walk through the trees, and plenty of active programming including play areas, recreational spaces, and spaces for relaxation and enjoyment. 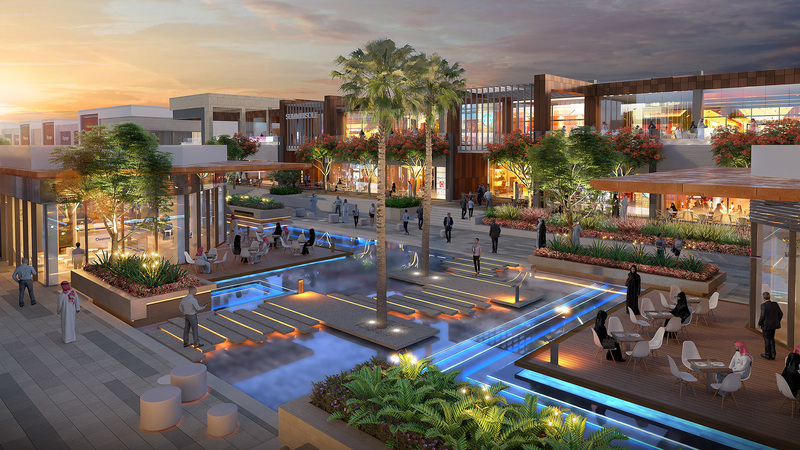 A new flagship destination for retail, hospitality, and entertainment will serve as the ultimate leisure destination for families, residents, and tourists. 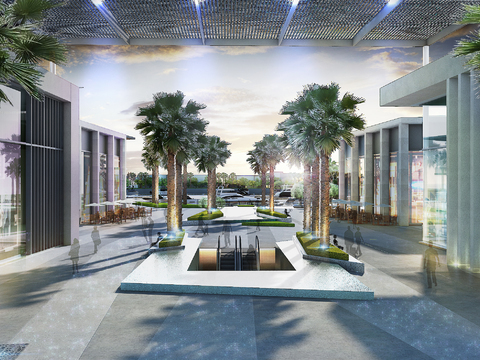 Cracknell’s design extends the mall’s aquatic theme to rooftop dining terraces, which create a dining experience that flows seamlessly from indoors to outdoors. 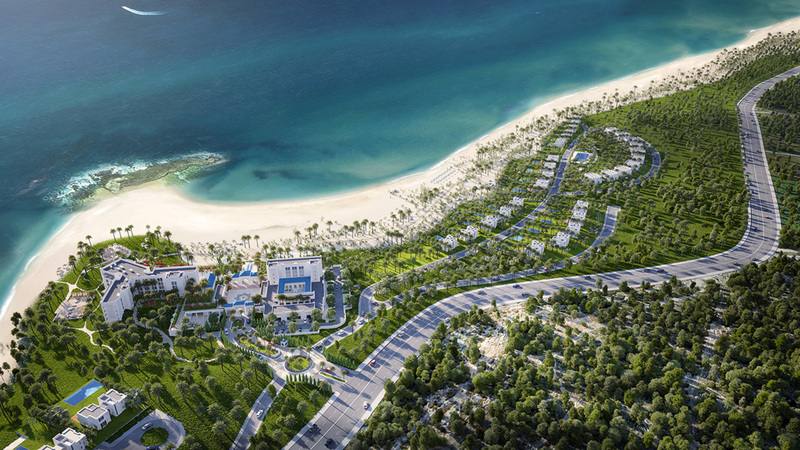 The arrival experience at the attached hotel is designed to be distinctly Omani in character, with arid plants and natural-looking materials that give a fresh take on traditional Omani design. 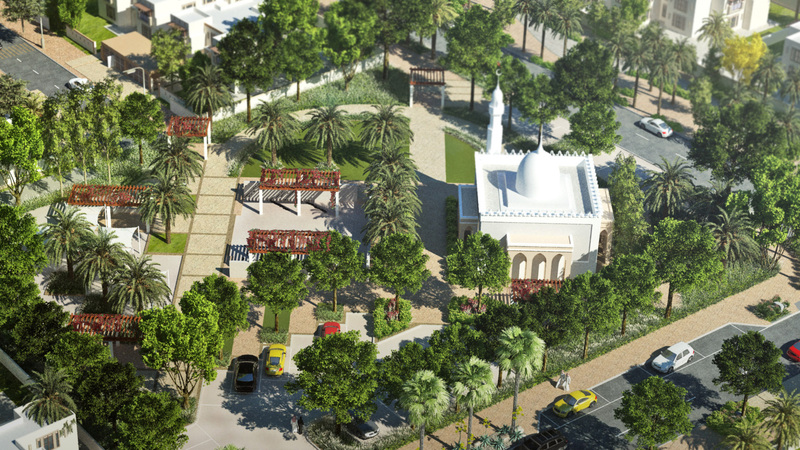 The city's premier traditional lifestyle community offers communal and active spaces in a family-friendly environment. 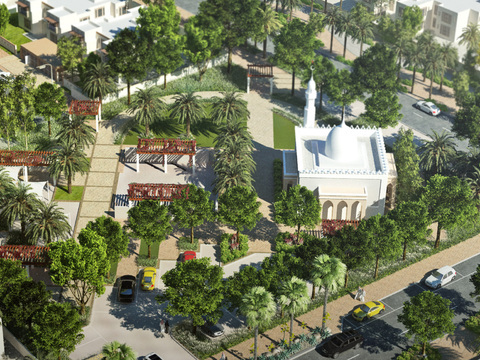 The design for the Community Clubhouse enables it to serve as both a landmark along the Boulevard, and a recreational and relaxation hub for residents. Facilities including a multipurpose room, park café and even a local art gallery draw the community together, whilst fitness and sport facilities help residents stay healthy. A themed children’s playground reinforces the development’s emphasis on family-friendly fun. 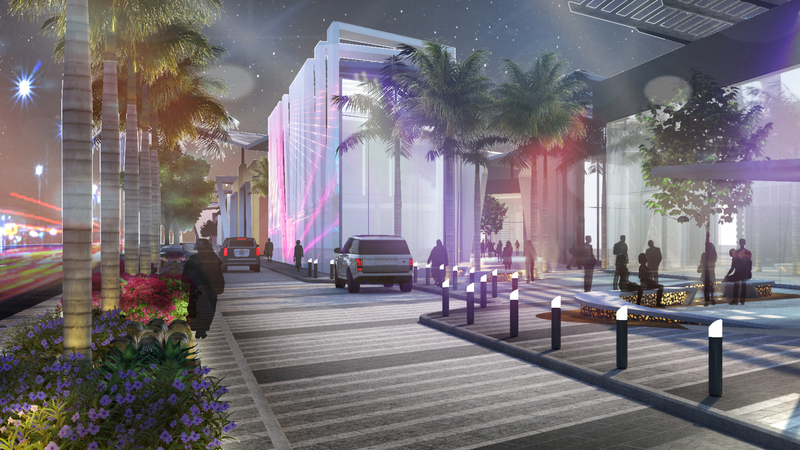 The Sales Experience Centre, nicknamed “The Hangar”, does triple duty as sales centre, client office and entertainment venue. 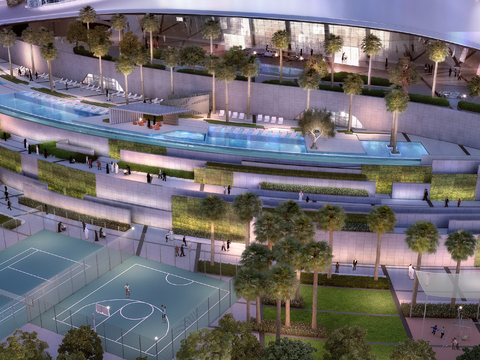 The architecture and landscape of the Hangar make it fun, funky, chic, playful, and contemporary. Urban art is dotted on buildings and other elements within the landscape. 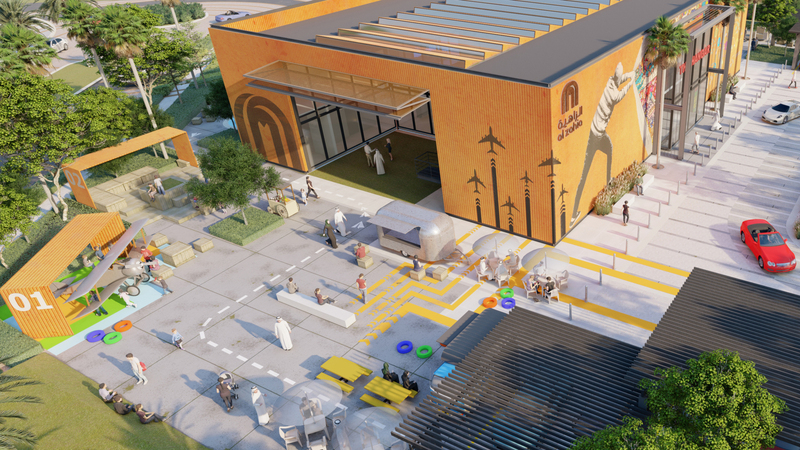 Underscoring the location's values of active leisure and community enjoyment, the Hangar is been designed to facilitate a wide variety of fun social programming including food wagons, an outdoor cinema, concerts, and Ramadan iftars. This high-end high-rise in the heart of Mumbai is bursting with amenities and redefines luxury living. 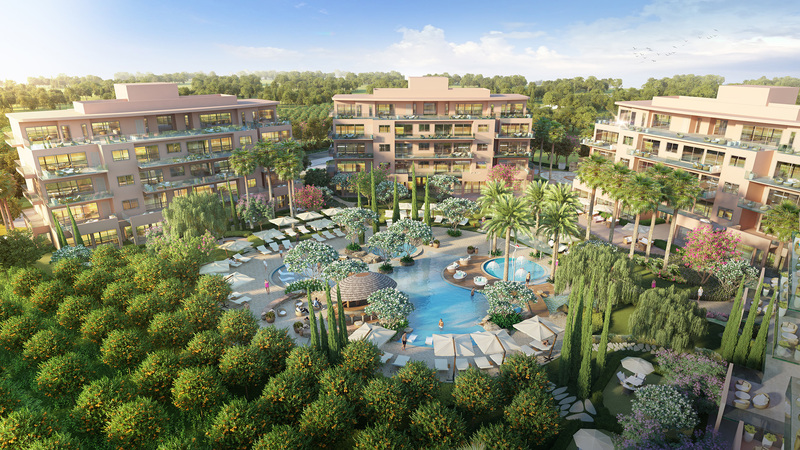 An amphitheatre, sculptured gardens, and pool and spa areas are beautifully appointed by Cracknell, and surround an outdoor clubhouse with spectacular views. Mumbai’s highest infinity pool in the city joins sky pavilions perched on the edge of the building, creating an otherworldly atmosphere with a view of the Arabian Sea. An exceptionally popular destination for Shenzhen’s beachgoers, Dameisha Beach Park required a refurbishment following extensive damage from a 2018 cyclone. Cracknell entered a competition to restore the 1-km public beach and surpass its former appeal. 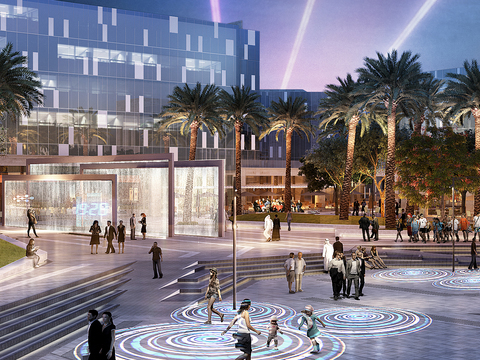 Cracknell’s design gives a unique character to the beach, bookending it between sun-themed and moon-themed plazas. Durable materials and artful arrangement holds up under as many as 200,000 visitors per weekend, and even connects them to the city via an underground metro link. 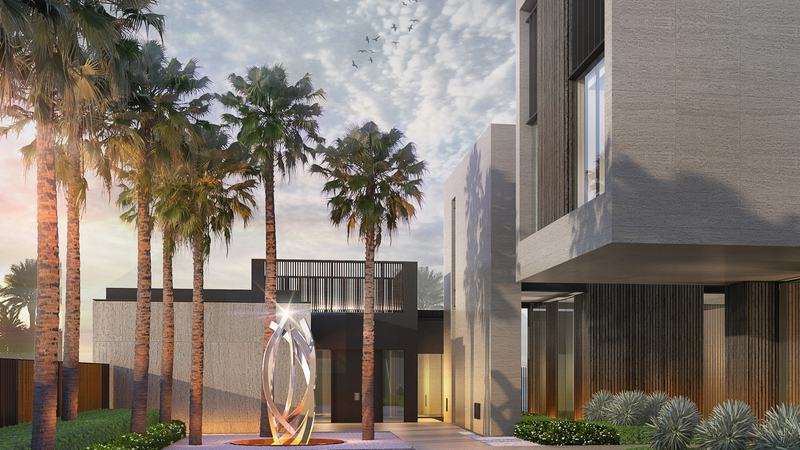 The new iconic residential community has raised the standard for luxurious urban living, with uninterrupted views of Zabeel Park and the Dubai Frame. 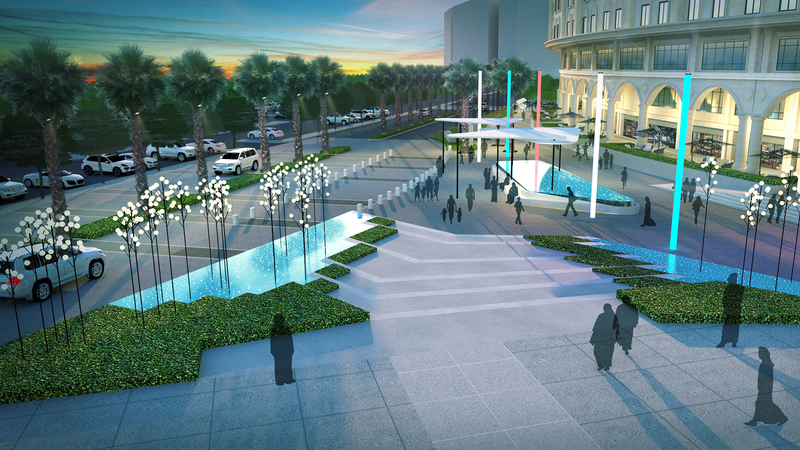 Cracknell’s design of the public realm creates a luxurious, serene atmosphere, transforming the sidewalks from pedestrian thoroughfares to destinations in themselves. 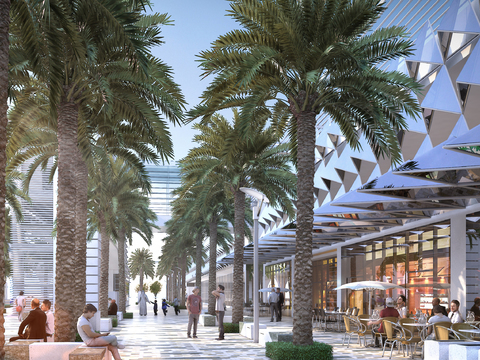 Shaded, usable passages dotted with food and beverage outlets invite residents to stop and refresh instead of hurry home. 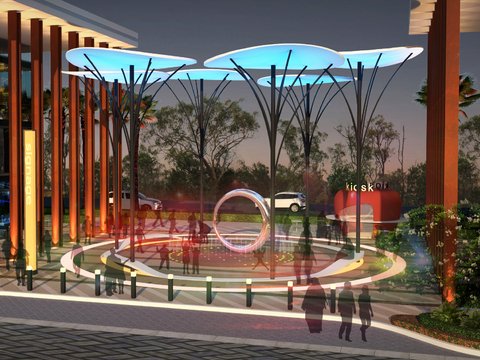 A playful water feature creates a colourful spectacle at night that draws and connects the community. 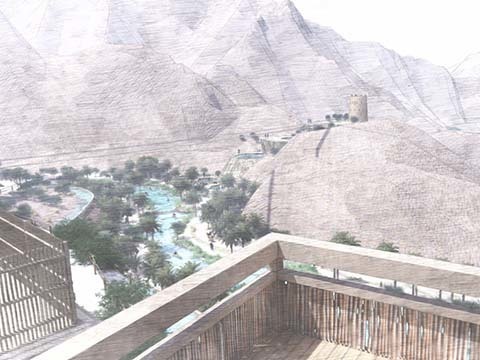 Located in the Shis Village tucked in the Khor Fakkan mountains, the Wadi Shis heritage and recreational development invites visitors to explore the site with the help of modern facilities. 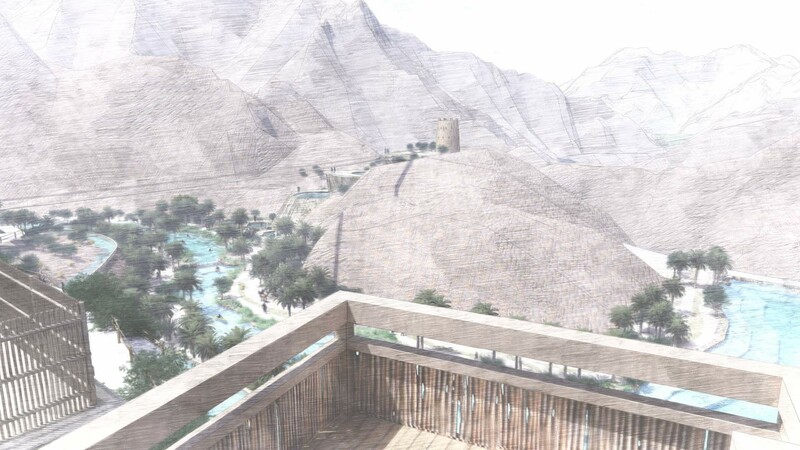 A new highway and rest station accompany a newly activated wadi with controlled water retention, allowing visitors to kayak through an unfolding wadi landscape opening to a reservoir. Local materials and building techniques have been used to preserve the local heritage feel, creating the perfect setting to experience a traditional way of life. 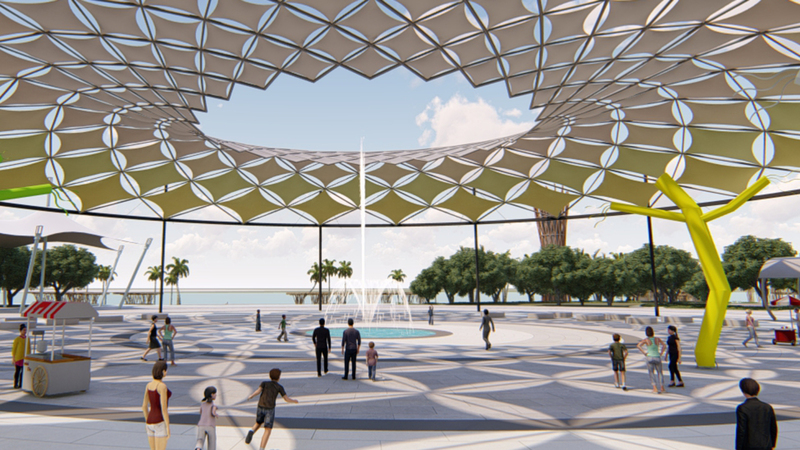 The development embraces “smart” technologies which will give access to real time data on the environmental conditions as well as facilities and activities through smart benches, public Wi-Fi, etc. The goal was to create a work-live-play landscape inclusive of sports, fitness and children’s play facilities, paths for walking and jogging, and outdoor spaces to allow residents, workers and visitors to relax and enjoy the environment. 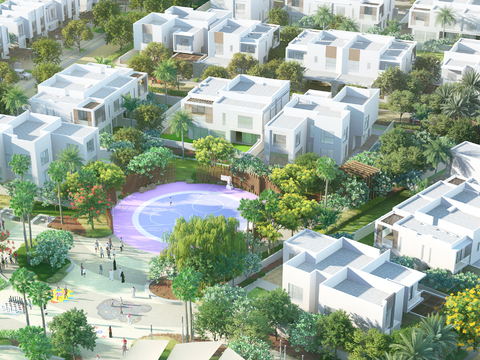 The main feature of the development is a large naturalistic lake which includes a stimulating waterfall. This family resort serves as an idyllic private paradise in the Seychelles. 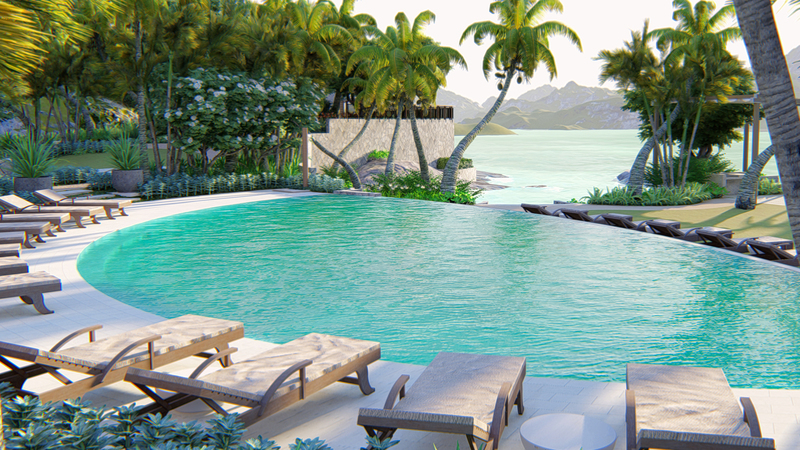 The design for this stunning mountain location uses natural contours to join the rainforest and beach together, offering unsurpassed views of the Indian ocean from every angle. Overcoming the elevation challenges of the site, intimate spaces are carved into the landscape and open up to a private beach. 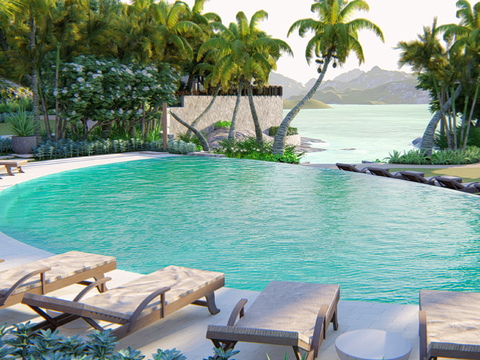 Elegant infinity pools and opulent spa-like facilities are within easy access of the residential villa and guest bungalows. 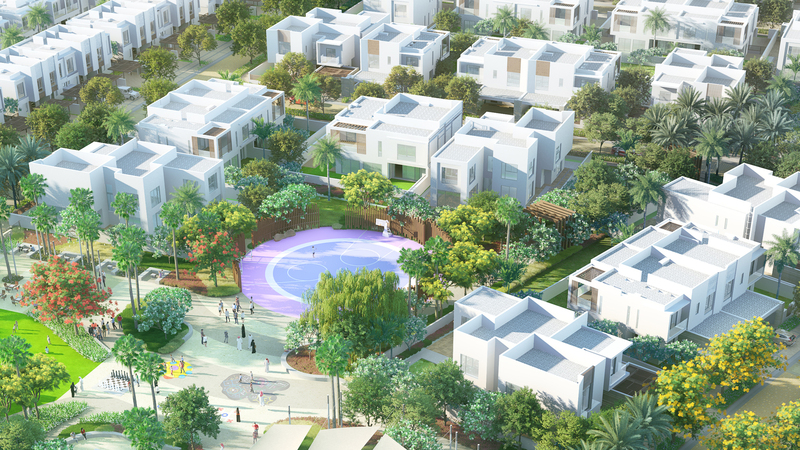 In this new development situated on the outskirts of the holy city of Makkah, Cracknell’s masterplan and urban residential design has created a landscape that raises the standard for suburban living. Thoughtful planting and design bring pedestrian-friendly elements to the public realm and streetscapes, creating shade and providing visual and sound relief from surrounding highways and developments. Walkable neighbourhoods and easy access to community parks promote healthy living. 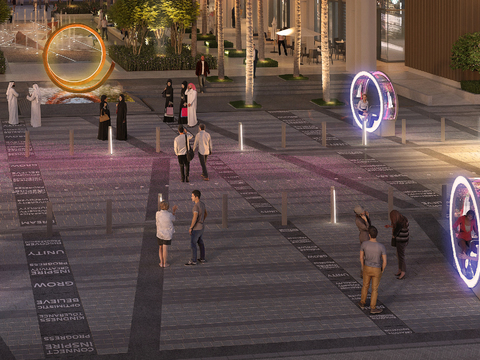 The open areas this city's new metro will create corridors of lively public realm and change the character of the city. Cracknell’s design for 33 kilometres of public space support the city’s mission of creating a healthy urban environment where walking, cycling, and public transportation are the norm. Hundreds of thousands of trees and plants line the network, and wide shaded footpaths double as a public art platform. The region’s iconic triangular design form is reflected in bespoke furniture and other elements throughout. Cracknell translated the concept masterplan into distinct landmark districts, unified under a uniquely local identity but each with their own story. One residential community enjoys suburban comfort and amenities, whilst another’s luxuriant spaces offer resort-like living. 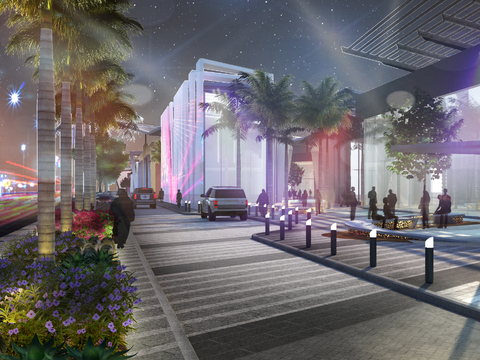 Business districts’ layout and lines reinforce their commercial characters. 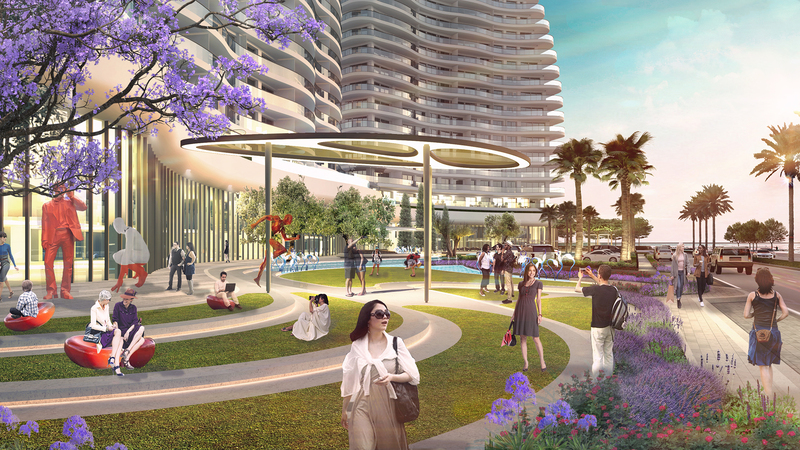 Terraces and plantings at the base of the iconic Tower have been designed by Cracknell in a fluid and cohesive style that ties the landscape and architecture together. 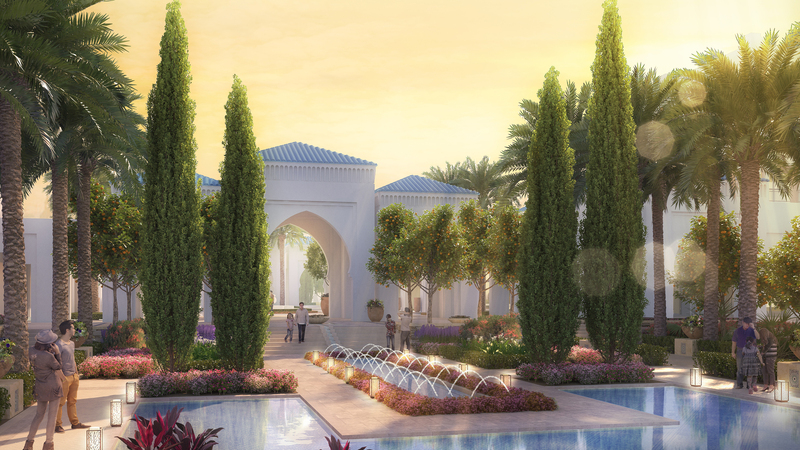 Blending Moroccan style with beachside luxury, Cracknell’s design for the resort’s outdoor areas pay tribute to traditional Moroccan architectural and design elements throughout. Borrowing from architectural design elements known more for enclosed spaces, the landscape creates a progressive sequence of outdoor ‘rooms’ that reference traditional courtyards and eventually open out onto the sea. A tone-on-tone light colour palette emphasises the resort’s open, airy, seaside atmosphere. Infinity’s outdoor spaces were designed by Cracknell to take advantage of its unique location and idyllic setting: a bold yet fluid design theme mimics the way the water surrounds the mountains, linking natural and man-made spaces and highlighting natural water elements and green public spaces. 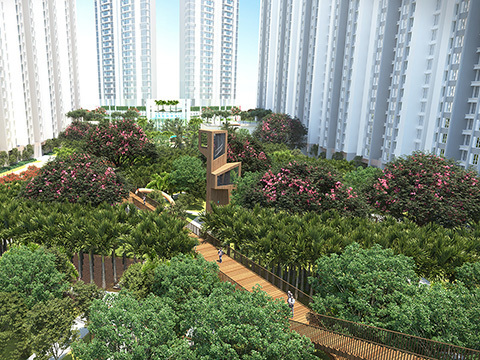 Outdoor spaces of the development connect to the surrounding public green belt. A large internal lake can be frozen into an ice-skating rink or drained for an events stage, creating an ever-changing public realm that transforms with the seasons. 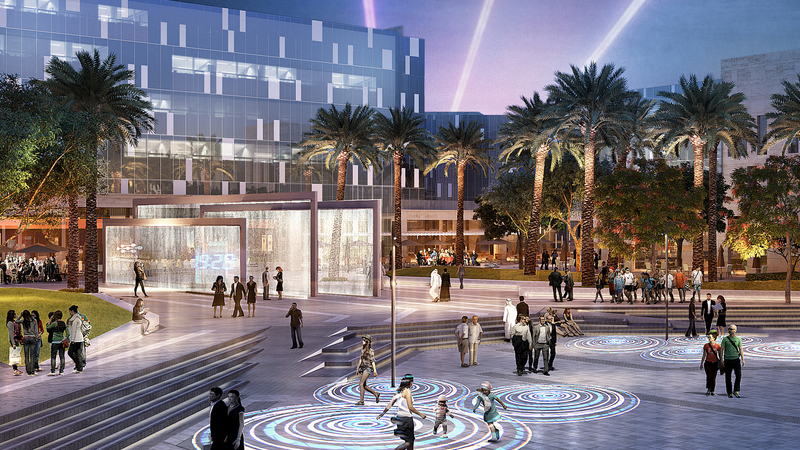 The design for this family-friendly retail development invites visitors to gather, shop, rest, and explore in a landmark destination. A sequence of plazas dot the main spine, serving as both way-finding elements and the perfect backdrops for selfies and memorable moments. 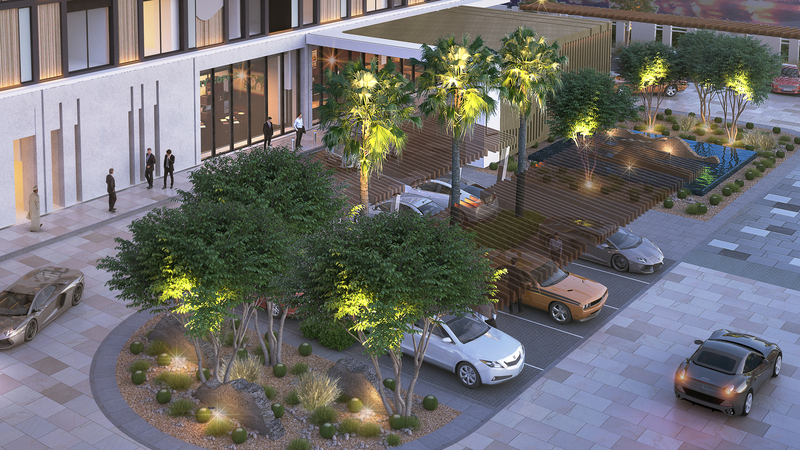 The palms of a square plaza give shaded canopy cover by day, transforming to atmospheric lighting by night. 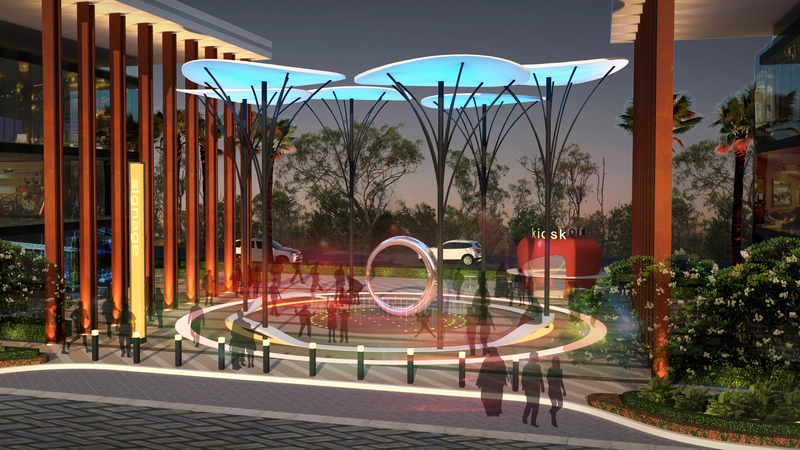 A round plaza’s colourful sculptural elements are visible from the highway and serve as the development’s landmark. 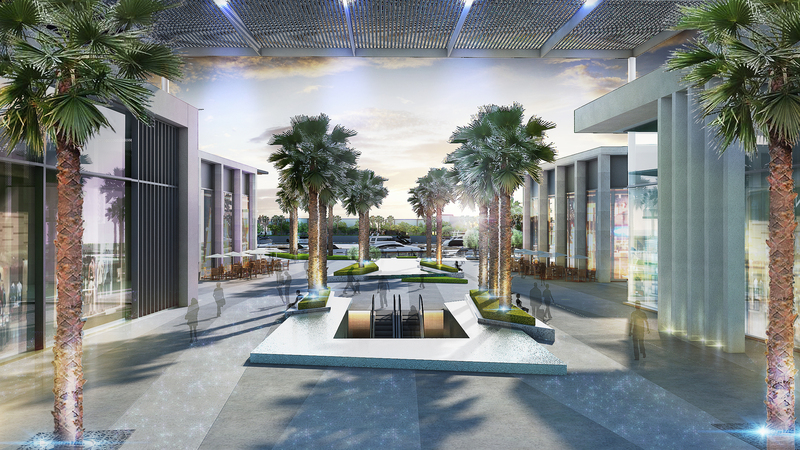 A clean, airy and light design gives this luxury retail destination a contemporary minimalist feel. 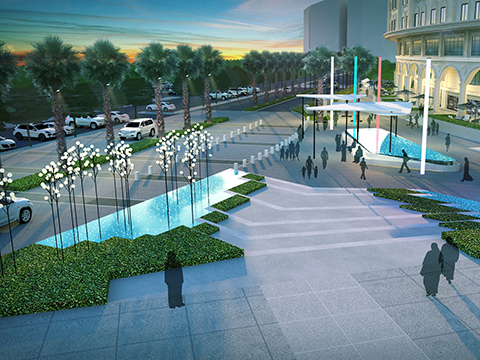 A ribbon walkway dramatically combines seating, lighting, and water features as it carries visitors along the development past points of interest. Moveable parklets alongside walkways cleverly extend open spaces. 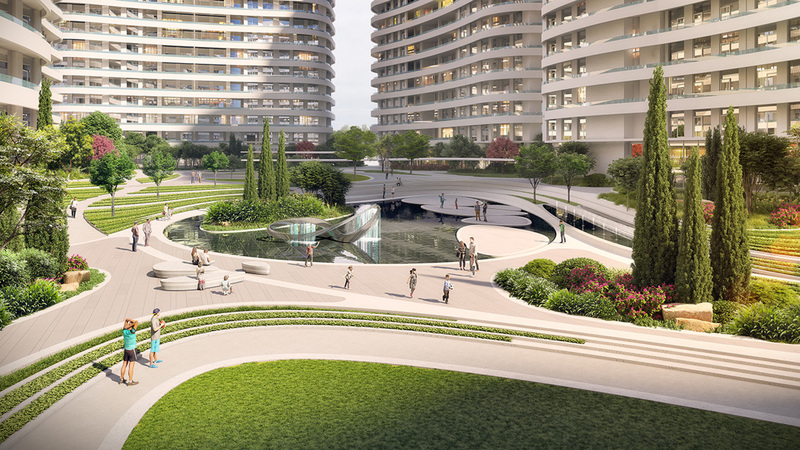 Seating areas emerge from the ground on curved ribbons that connect the design to functional elements, and surround active water features placed for visitors to sit and enjoy. 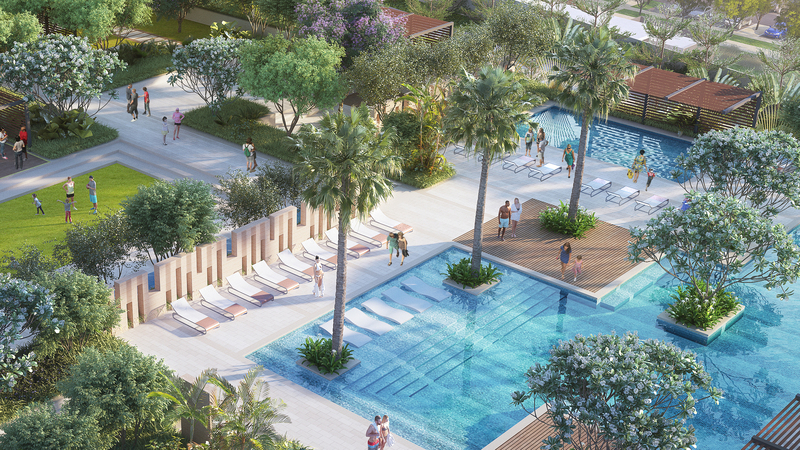 Limassol Del Mar’s iconic beach resort design merges the hotel with the sea itself, reflecting the essence of the sea in every landscape detail. 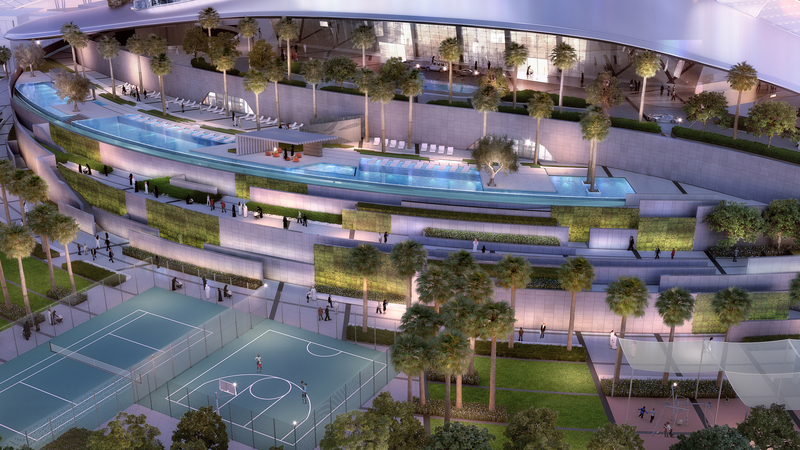 The fluid, curvilinear design of the landscape creates layers of spaces reminiscent of water lapping at the hotel’s edge. 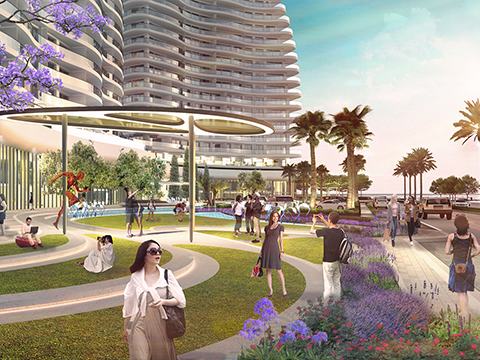 Planting, paving, and layout elements of the landscape create wave and ripple patterns. 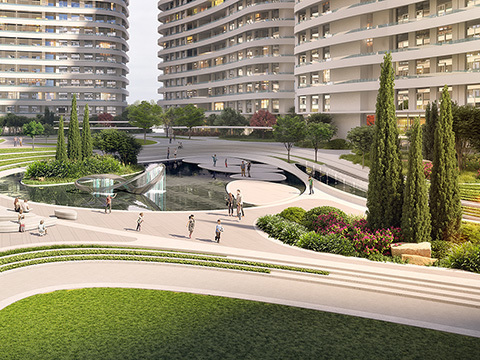 Garden pockets surrounded by water form intimate private spaces for reflection, whilst lushly-planted curved walkways invite visitors to shop at the luxury retail. 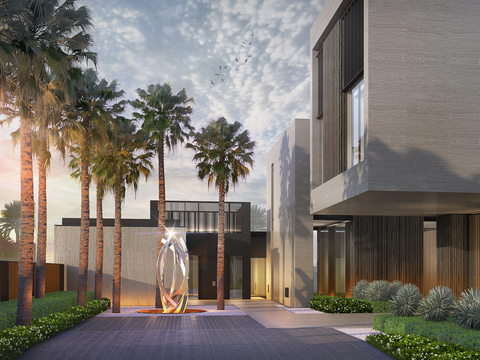 This private residential compound is rendered in tasteful, elegant minimalism that creates both simplicity and privacy. The multiple villas of this family compound are each given quiet, intimate spaces, yet are joined and punctuated by shared focal points. Trees form part of the architecture, shaping the gardens and directing the visual lines toward focal points of interest. Exceptional use of space creates ‘wow effects’, such as landscaped corridors leading to floating sculptural elements. Attention to detail and a contemporary sensibility give this project a sleek, modern feel. 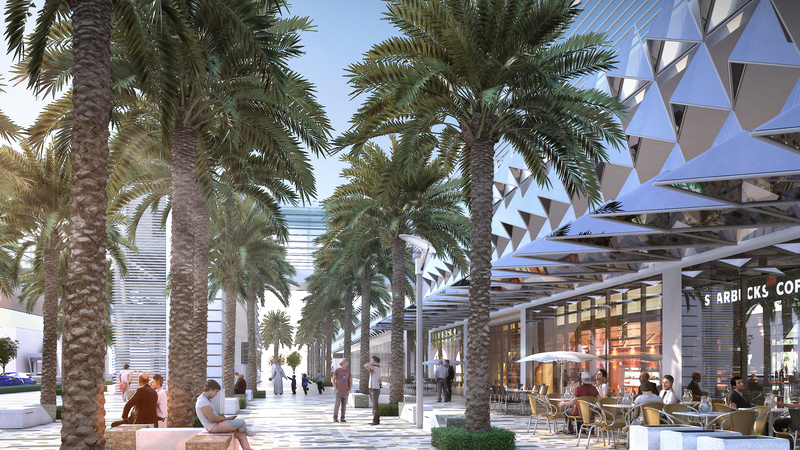 The challenging location of this pedestrian corridor between retail and office developments is marked by a lack of water and high exposure to heat, sun and dust. 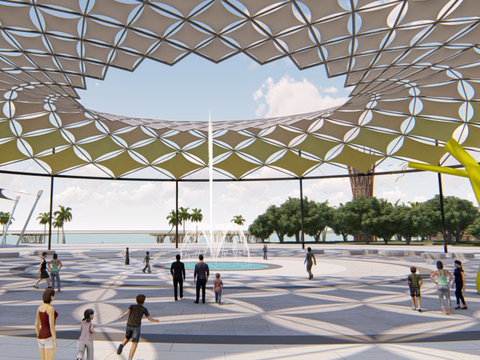 In response, the design language is that of a desert oasis, with natural materials, plants, and colours that are sustainable and drought-resistant. 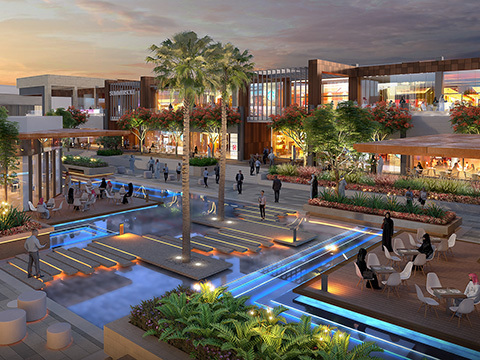 A retail development extends the modern oasis theme with delightful surprises such as restaurants that float on water, and glass-enclosed galleries that protect from heat in summer and open to fresh air in winter. Sculpted sand dunes add character and serve as visible landmarks. 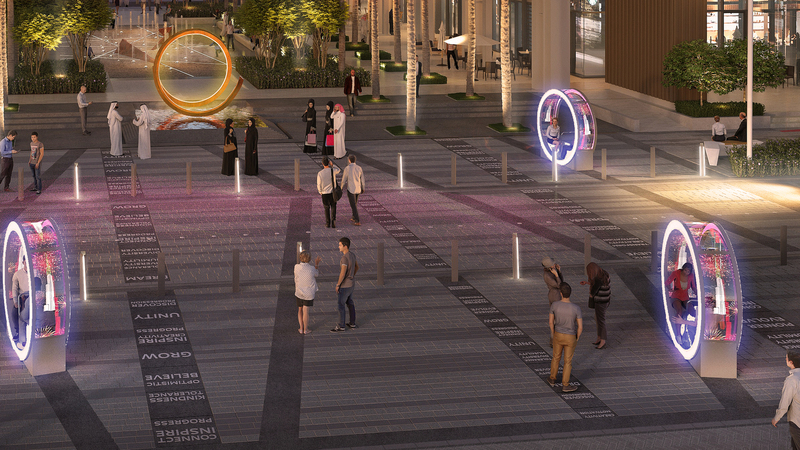 A mixed-use development at the foot of an important city mosque is being transformed into a pedestrian-oriented public space that adds value to retail. 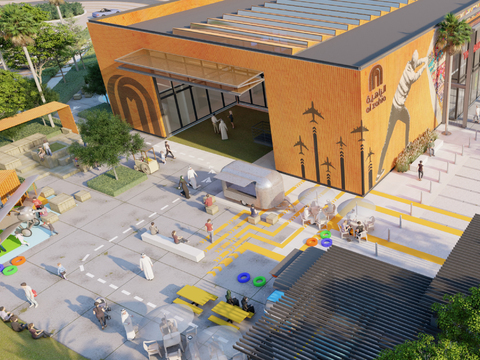 Through an intelligent use of space, the public realm’s redesign creates welcoming entrances to the site, connecting and pulling visitors toward shops. Views of the mosque and its minarets are centered as stunning backdrops to walkways and open spaces. Widened adjacent roads create circulation pathways for pedestrians and superior vehicle access. 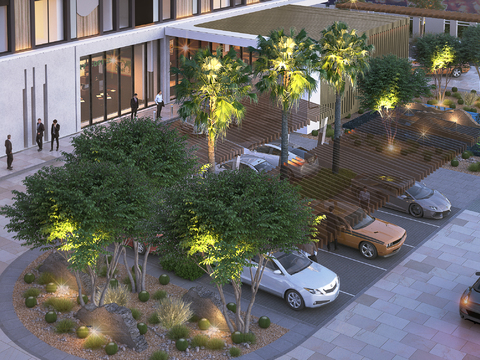 Cracknell designed the soft and hardscapes for this residential development in keeping with the local Mediterranean topography and theme. 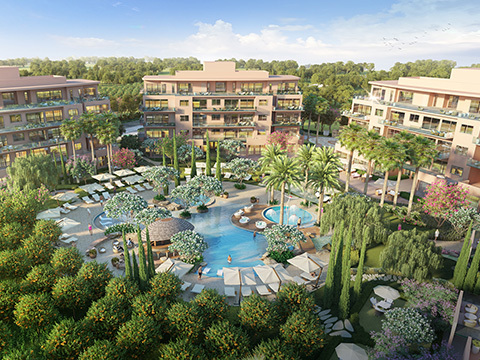 The design language involved creating a sanctuary-like setting, with a resort style pool nestled amongst Cypriot foliage evoking a sense of being tucked away in a private forest. A simple yet elegant design theme is consistent across landscape elements such as paving and shade structures with Mediterranean touches.